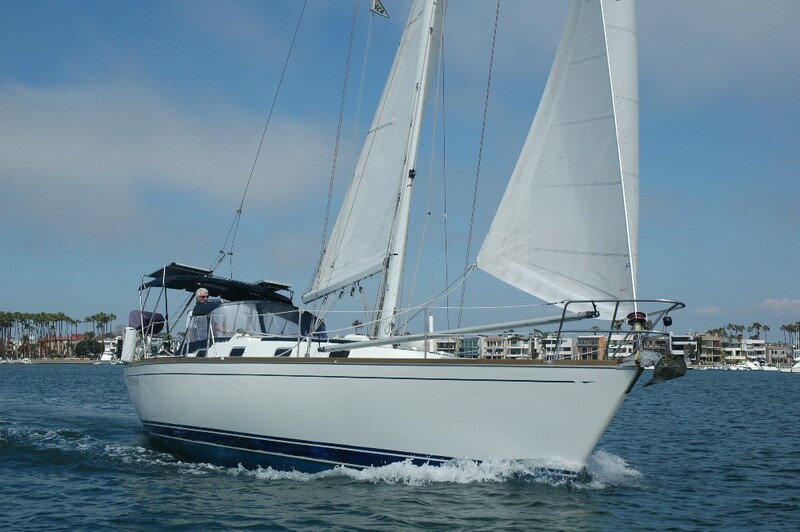 Extensively updated classic Ron Holland Swan re-configured for effortless short-handed cruising. Replaced teak deck, repainted hull, electric in-mast furling mast, electric winches & genoa furler, professionally re-configured reduced draft keel & structure, bow thruster. With just four owners since her original launch in 1979, the German registered MOIN has been lovingly maintained and extensively updated and re-configured for easy short-handed sailing having been originally designed by Ron Holland to be orientated towards the IOR racing rules. 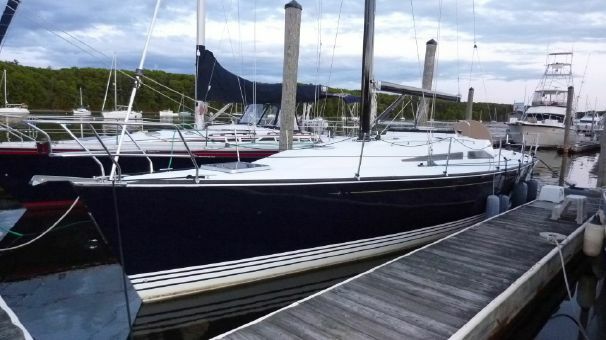 She represents a rare opportunity to purchase such a yacht with only twelve of this flush deck race version having been built by the legendary Nautor Swan yard in Finland. 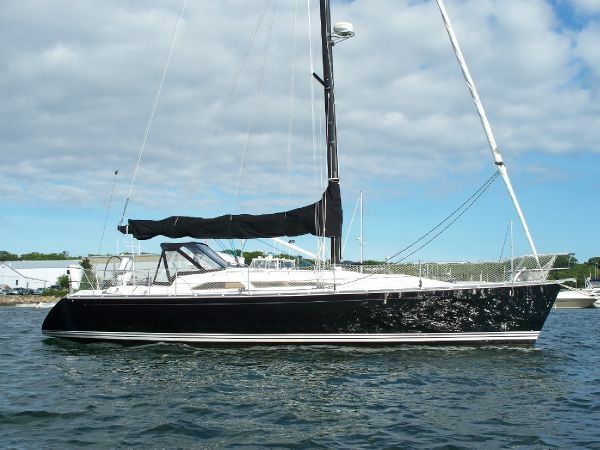 Her current seller has in fact enjoyed owning her so much that he has owned this very boat twice! 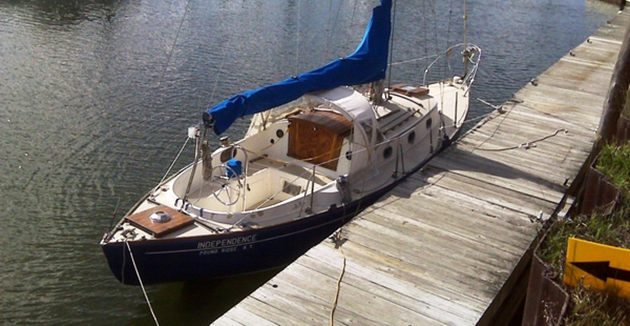 Her many upgrades over the years to both keep her more up to date but to also make her easier to be handled short-handed include; a replacement mast with electric in-mast furling, a bow thruster, new Nanni diesel engine, electric genoa furler, two electric winches, updated Raymarine electronics and a professionally modified keel construction now with a bulb to the bottom of keel to allow for a slightly reduced draft from 2.2m to her now 2.0m draft. Her interior accommodation was upgraded in 1995 to make it more cruiser rather than race orientated. Her original teak decks have also since been replaced for new teak in 2003 when her hull was also repainted whilst under the current seller’s previous ownership of MOIN. Replaced Nanni 4.50 50hp marine diesel engine on a shaft drive. Replaced mast with electric in-mast furling. Professionally altered interior for more comfortable cruising orientated sailing. Professionally re-configured fin keel to reduce draft to 2.0m. Replaced in-mast furling battened mainsail. Replaced genoa on an electric furler. “The Swan 39 Racer Story of MOIN. A fully automated 39 foot performance cruiser perfect for single or couple handling. The Swan 39 Racer is a timeless and classic design – built for speed and comfort with the legendary ruggedness of the Nautor boats. 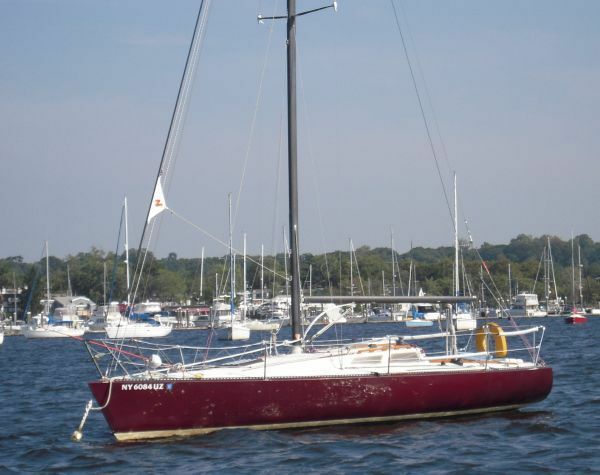 Designed by Ron Holland, the Swan 39 represents the epitome of the racer/cruiser. Only 33 of this particular type were built. This Swan 39 Racer has undergone some notable upgrades in the recent years, including a new mast, bow thruster, new engine in 2014/15. 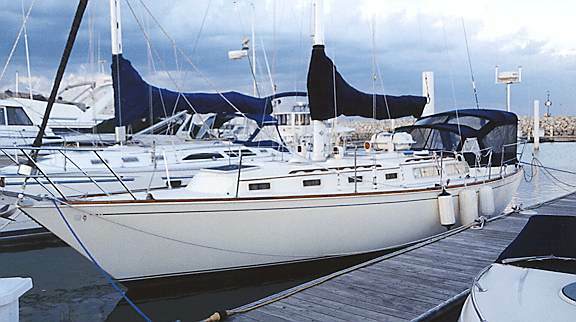 In addition, this boat is fitted with electric forestay furler, and in/mast electric mainsail furler, as well as two electric capstans in the cockpit. Today the Swan has a modern Raymarine Navigation system, including a big screen. A new strong autopilot and an effective diesel heating system provides safety and comfort. MOIN started her life as Roratonga in 1979 delivered from the shipyard of Nautor Swan to Germany. Since then she had 3 owners. From the mid nineties to 2003 the Swan was called Nirwana owned by an experienced yacht builder who strengthened her keel construction, modified the keel from 2,20m to 2,0m depth, now with a torpedo. The interior was redesigned from racer to performance cruiser. In that time the boat sailed from its home harbour in North Germany to Finland and Portugal. The hull was repainted – 2003. GRP deck with a caulked teak deck over. Flush deck style as per the race version’s design and construction differentiating it from the more “standard” cruising version. The teak to the; deck, cockpit seat bases and sole was replaced – 2003. Professionally strengthened keel structure – 2003. The rudder blade is GRP and supported by a short skeg. Replaced Nanni N4.50 4-in line cylinder marine diesel engine producing 50hp at 2,800rpm – 2015. Closed cooling with heat exchanger. Engine was last serviced in October 2017 when the current seller purchased the boat. Engine hours: 300 as at January 2019. Shaft drive with stainless steel shaft supported by p-bracket. Side Power SE100/185T Bowthruster – 2009. 6x batteries in total all from - 2017. 2x 12v engine start batteries? 2x batteries for the; bow thruster, Electric genoa furler and anchor windlass. 2x batteries for the remaining systems (refrigerator/electronics/lighting etc). Via the Sterling 1240 CED 40Amp battery charger, the engine mounted alternator, shore power connection and inverter. Cold water tap over the sink in the galley area and the heads. 120 litres in one stainless-steel tank. 120 litres in a stainless-steel tank. NAVIGATION & COMMUNICATION EQUIPMENT – Installed - 2009. Raymarine C120 Display + AIS. Raymarine C120 Chart Plotter display. Gimballed stainless 3-burner gas stove and oven. 1x Stainless steel sinks with cold water supply. Cold pressurised water tap over the wash basin. Diesel heatingwith outlets to all the cabins and heads. Both deckhead and reading lights. Radio with cabin and cockpit speakers. The accommodation was professionally altered by her then owner who was a boat builder to make her more cruiser than race orientated. 2x single berths in 2 aft cabins plus a double berth to the fore cabin and 2 further single berths in the saloon. Burma teak interior joinery made up of faced marine plywood with solid teak where appropriate. Marine ply, fibreglass or timber planking to the deckhead. Teak and holly or teak slats to the cabin sole. White with pinstripe upholstery to the cabin cushions. Double berth to the fore cabin with a removable central cushion to form two single berths if required. Teak slats to the cabin sole. Vertical poles providing a handhold. Stainless-steel wash basin with a tap over. Built-in cupboards over the WC. Dining table position slightly to port with a U-shaped sofa to the port side and a further sofa to starboard. 1x Single berth above the sofa to starboard. Teak & holly to the cabin sole. 2x Vertical poles providing handholds. Chart table with storage inside and draws under. Book and general storage shelves. Bulkhead space for mounting electronics to. Teak & holly to the sole area. Gimballed stainless-steel gas oven and 3-burners stove with stainless-steel grabrail and cupboard under. Worktop with fiddled edges, access hatch to the refrigerator and sliding door storage cupboards over. In the companionway is the sink with a water tap and timber insert to create additional worktop space and cupboards behind. Steps leading up to the cockpit. Replaced keel stepped anodised aluminium masthead rigged mast with in-mast furling and spinnaker pole track – 2009. Rod standing rigging – 2009. Hydraulic adjustable boom vang with aluminium cover. Shroud base genoa sheet protectors. 2x Self-tailing 2-speed halyard sheet winches to either side of the companionway entrance. 2x Self-tailing electric 2-speed genoa sheet winches. 2x Self-tailing 2-speed mainsheet winches. 2x Self-tailing 2-speed spinnaker winches. Hyde Sails in-mast furling battened dacron mainsail – 2009. Hyde Sails furling dacron genoa - 2009. Hyde Sails spinnaker – 2009. Hyde Sails asymmetric spinnaker – 2009. Light airs spinnaker – 2003. Hyde Sails storm jib – 2009. Two rail wire guardrails and stainless-steel stanchions. 12v Electric deck mounted anchor windlass. Appropriate number of stainless-steel mooring cleats. Various mooring warps and fenders.